Charitable giving stands at the very core of the work we do here at Children’s Hospital of Pittsburgh of UPMC. It has for more than 125 years. Your investment in Children’s Hospital is an irreplaceable part of a tradition of caring that spans generations. We remain deeply grateful to you for your part in the success of this institution and the health of the region’s children. The John G. Rangos Senior Cancer Research Scholars Fund provides funding to support pioneering research in the field of pediatric hematology/oncology. Here at Children’s, we recognize that research has the potential to change the world as we know it. Advances in pediatric medicine are only made when committed physician-researchers have access to the educational opportunities and funding they need to pursue scientific investigations designed to uncover answers to the most challenging of medical mysteries. With the support of philanthropists like you and funds like the John G. Rangos Senior Cancer Research Scholars Fund, our physician-researchers have access to the resources they need to be successful. Please accept our deepest gratitude for your many contributions to Children’s Hospital. Your support makes such a difference. Thanks in part to your commitment to the John G. Rangos Senior Cancer Research Scholars Fund, Children’s Division of Pediatric Hematology/Oncology continues to provide exceptional patient care, while also contributing to the field of pediatric oncology with a high-quality research program. Division staff works tirelessly to ensure that every child in need of cancer treatment receives the exceptional care he or she needs. Contributions like yours help to ensure that our physician-researchers have access to the resources they need to give our kids the very best chance to make a full recovery. We remain so grateful for your support. As the largest, most comprehensive childhood cancer and blood disease center in western Pennsylvania, eastern Ohio, and northern West Virginia, Children’s Hospital strives to be a leader in the field of pediatric oncology/hematology. A robust research program is critical to this mission. Children’s Hospital is a full member of the Children’s Oncology Group (COG) – the world’s largest group devoted to childhood cancer research. 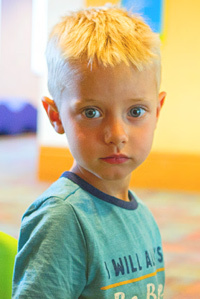 With Children’s participation in the COG, our patients have access to nearly 100 active clinical trials – studies of the most promising and newest cancer treatments. In addition to cutting-edge research, Children’s hematology/oncology program further emphasizes the importance of providing the patient and his or her loved ones with care that is fully patient- and family-centered. Children’s program incorporates an array of supportive services and resources designed to help the entire family through treatment. These services include access to social workers, psychologists, physical and occupational therapists, child life therapists and others who can help with the physical, emotional, social, educational and even the financial challenges of treatment. Thank you for your generous investment in Children’s cancer program. The John G. Rangos Senior Cancer Research Scholars Fund provides funding that helps to advance our specialists? progress. We remain so grateful for this critical source of support. 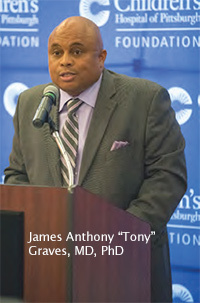 This past fiscal year, the Rangos Research Scholars Fund supported the work of James Anthony “Tony” Graves, MD, PhD. Tony?s work is focused on understanding and improving therapies for some of the most complex and deadliest forms of childhood cancer. Tony’s research centers on stopping tumor growth by targeting specific proteins that are critical to cancer cell survival. Tony is focused on developing a better understanding of the molecular processes involved in cancer cell survival to attempt to identify potential therapies to eradicate the cancer cells without harming healthy cells. Tony’s most recent manuscript on his research, “N-Myc Deregulates Mitochondrial Dynamics,” has been accepted into the journal Cell Death Discovery and is currently in production. caveolin-1 affects cancer cell development. We look forward to sharing more with you about Kelly’s work in the year ahead. Your commitment to the Rangos Research Scholars Fund gives our researchers the funding needed to advance the sort of scientific inquiry that has the potential to change outcomes for kids diagnosed with cancer. KDKA radio interview with John G. Rangos about the 125th Anniversary of Children’s Hospital of Pittsburgh.